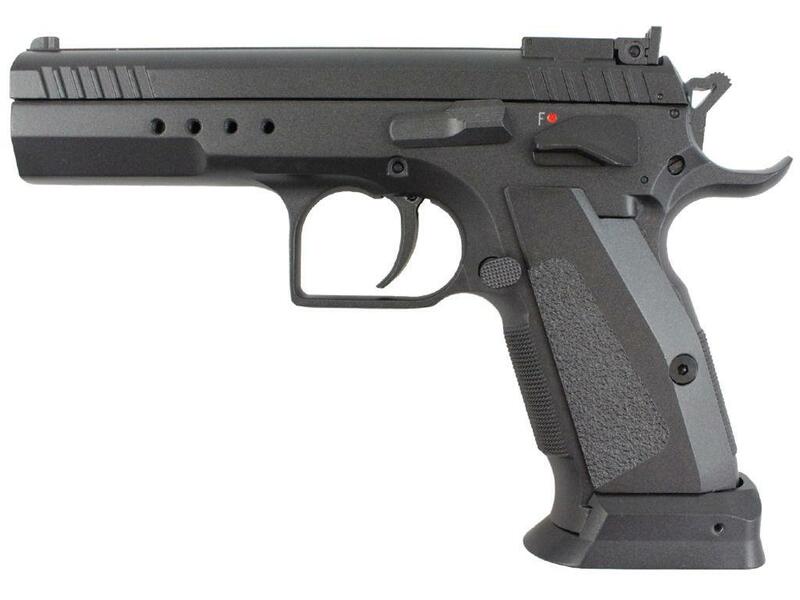 KWC Model 75 TAC Blowback BB Pistol | ReplicaAirguns.ca | Easter Weekend Sale! 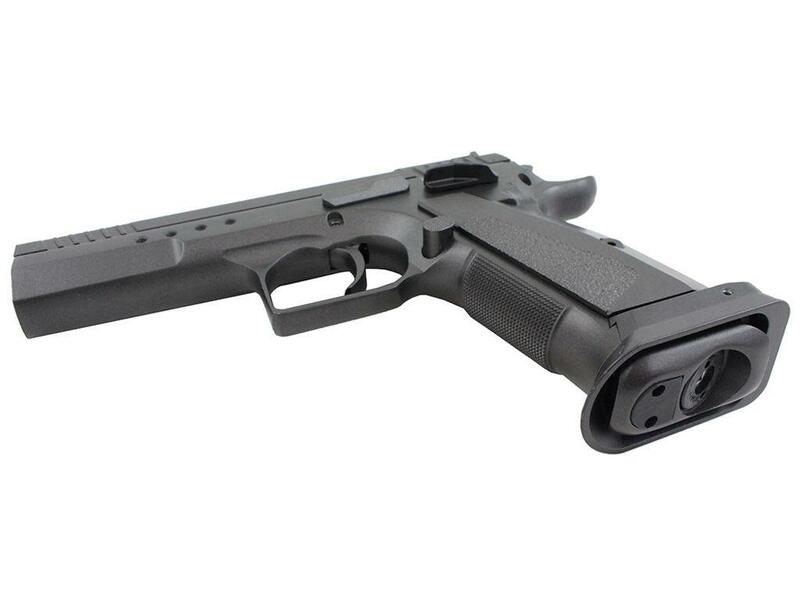 Trigger Pull: The trigger pull on the KWC TAC Model 4.5mm Blowback BB Pistol is what you would expect from a full blowback, true single action only pistol. It is nice and light with a very short take up and smooth release. 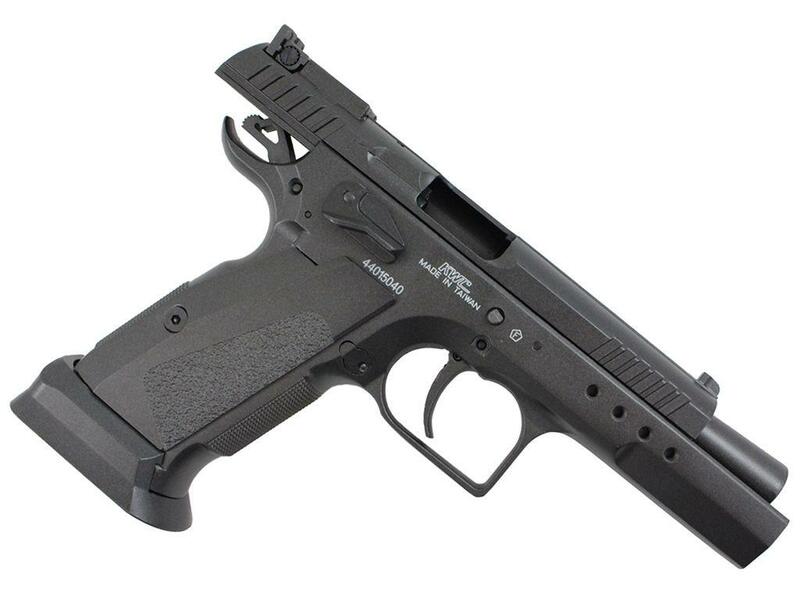 If you're looking for a pistol that can shoot accurately and quickly, then look no further! Accuracy: I did take the opportunity to do a quick field test for the KWC TAC Model 4.5mm and I can tell you it shot an average of 325 fps on a not all that warm day and I also got a fairly tight 2-inch, 10-shot group form my standard 20 foot rested position. The single action only trigger is nice, short, and crisp followed by a snappy hard blowback action. Build Quality: This BB Pistol is quite well built being that it is pretty much entirely metal (even the grips). It weighs in at a stout 2.5 pounds, so be prepared for a heavier gun. The tolerances are very good with very little slide slop and the seams are virtually non-existent. The dark golden brown color is unique, but as per typical KWC air pistols, the rather thin powder coating is prone to wear off on the high spots and metal on metal areas. Realism: The KWC Model 75 TAC is a stripped down version of the KWC Tanfoglio Gold Custom Blowback BB Pistol I reviewed earlier. 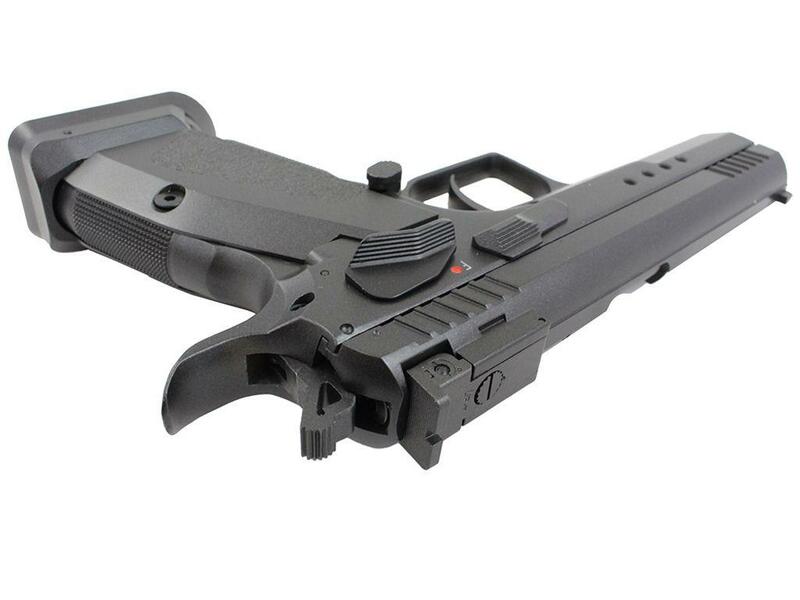 Basically it is the same gun, but with a rear sight and no sight rail or compensator. In terms of functioning and looking like a real gun, it has it all: a full size drop out metal magazine, full blowback operation, full slide lock, and of course it can be field stripped if need be. Comments: Overall the KWC Model 75 TAC 4.5mm Blowback BB Pistol is a really nice all metal airgun to shoot. I found it to be really well balanced which allowed me to shoot really quickly and yet stay right on target even with the heavy snappy blowback operation. If you already like the KWC Tanfoglio Gold Custom Blowback BB Pistol I reviewed earlier, but perhaps want something a bit more compact and without the need to add an additional red dot sight, then check out the KWC Model 75 TAC. I tend to be more interested in revolvers - I'm pretty sure that I have almost all that are currently on offer. Perhaps for that reason, coupled with the fact that this pistol is on the somewhat pricier side, I resisted buying it for so long. I'm not sorry that I did - had I purchased it earlier I would likely have been all about the semi-autos and not have amassed my rediculous collection of revolvers. This is a fabulous pistol. The first thing that you notice is the cold weight. It is heavy -all metal, including the grips, which accounts for the 'cold in the hand' feeling that you get when you first pick it up. The finish and the build are perfect - absolutely no complaints, however to be honest, I haven't used it enough to experience wear. The deep brown/grey finish is beautiful but somehow feels a bit thin and I would expect some wear in the high spots after some serious use. The blowback is very strong - you really feel that you are shooting something. This however, is a replica - a brilliant one, but it is obviously not a firearm and as such, all effort in its manufacture has been put into creating a facsimile of every detail of form and function in the real thing - at the expense of gas efficiency and fps though. To be honest, as long as it shoots somewhere over 300 fps, I'm all good. Make no mistake, you feel that you are shooting around 500 fps - a very heavy pistol, with a very heavy blow-back which, not surprisingly, results in a very heavy use of gas and a surprisingly fast rate of cool down between shots - best to pace yourself with this one. Great gun and worth every penny. 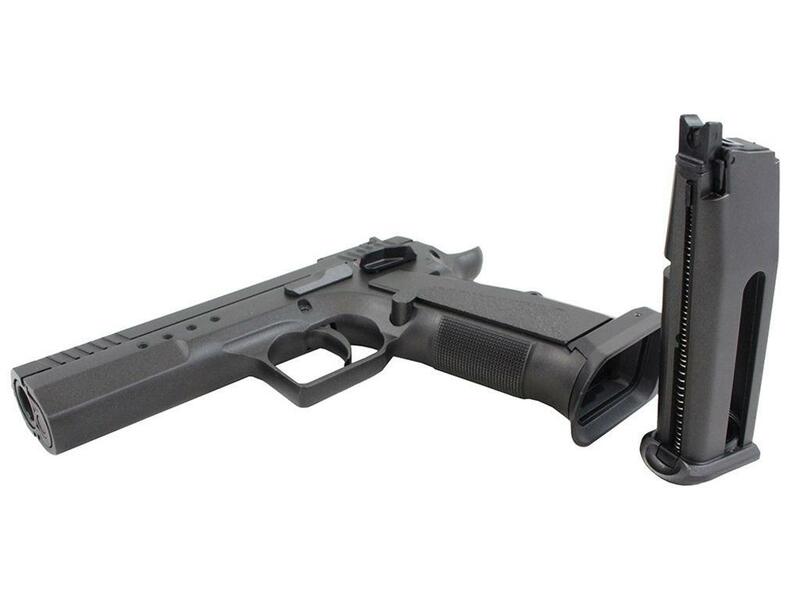 http://www.ReplicaAirguns.com - KWC Model 75 Tac Blowback BB Pistol Table Top Review. - Pretty much all Metal - Even the grips! 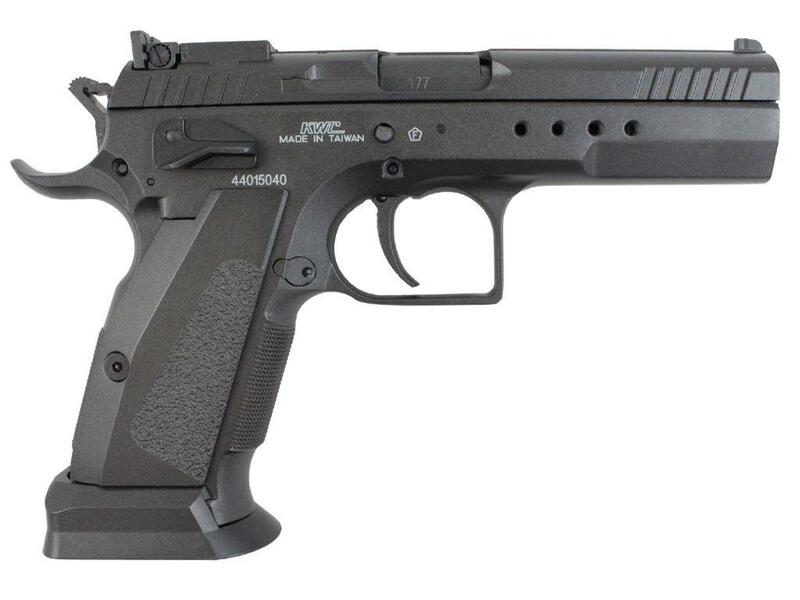 This is the Table Top Review for the KWC (Tanfoglio) Model 75 Tac Blowback BB Pistol. I show you around this KWC Model 75 Tac replica pistol and go over its main features and specifications. I also do a field strip and talk about some of the pros & cons. Overall the KWC Model 75 Tac Blowback BB Pistol is a really nice all metal airgun to shoot, I found it to be really well balanced which allowed me to shoot this blowback BB pistol really quickly and yet stay right on target even with the heavy snappy blowback operation. If you already like the Cybergun - KWC Tanfoglio Gold Custom Blowback BB Pistol I reviewed earlier, but perhaps want something a bit more compact and without the need to add an additional red dot to it then check out the KWC Model 75 Tac. 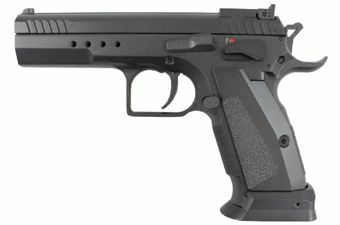 http://www.ReplicaAirguns.com - KWC Model 75 Tac Blowback BB Pistol Field Test Shooting Review.